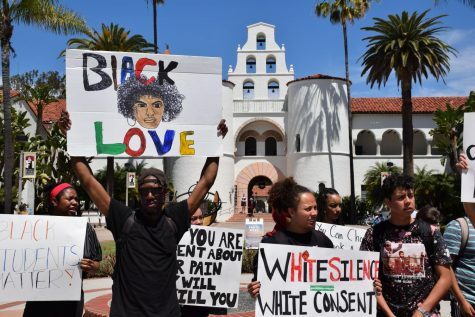 Following a silent protest of San Diego State President Elliot Hirshman during a ceremony to swear in incoming Associated Students President Jamie Miller, protesters surrounded an SDSU Police cruiser containing Hirshman Wednesday evening and demanded an apology. The protesters said Hirshman’s email was not critical enough of the posters, and asked for stronger support from the administration. After swearing in Miller, Hirshman quietly left the council chambers when the protesters arrived. Outgoing A.S. President Blaire Ward tearfully offered her support for the protesters, who later voiced their concerns during a public comment session. 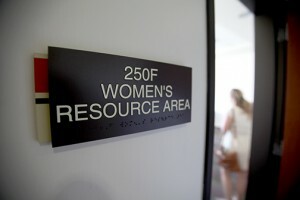 “We tried to engage with (Hirshman), but he quickly bolted out the door,” senior biology major Hassan Abdinur said. 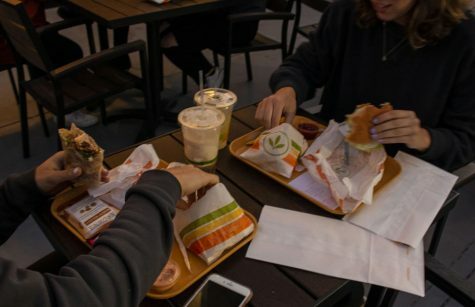 “Things have been building up and building up and the university hasn’t done anything so this was our opportunity to kind of stand face-to-face, really close, actually I smelled his breath, with the president of the university and tell him how we feel about what’s going on,” Abdinur said. 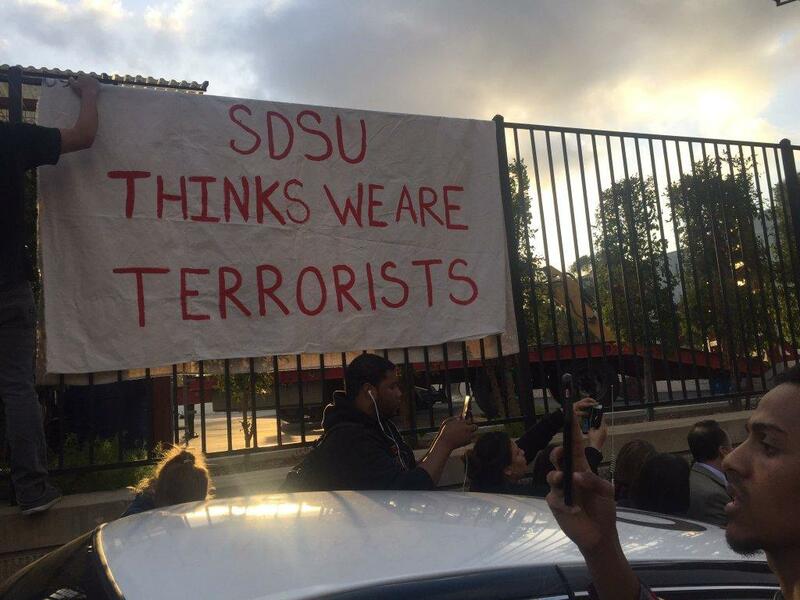 SDSU senior Osama Alkhawaja said “what is lacking from our leadership is courage,” and implored not just Hirshman, but also members of A.S. to defend those named in the posters. 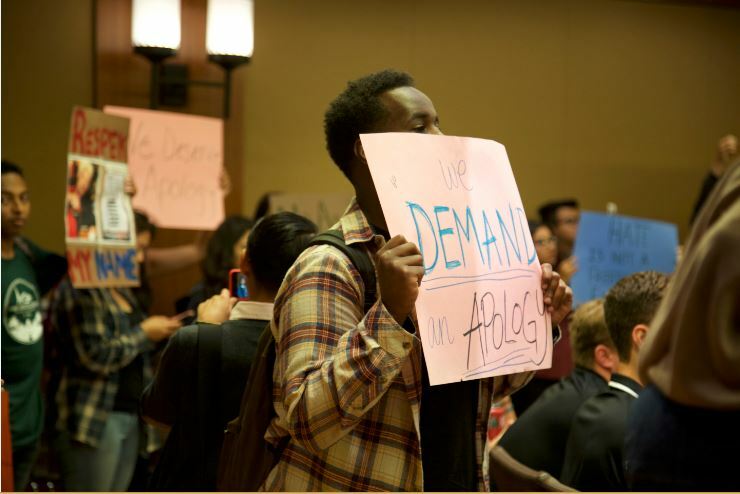 Demonstrators demanded an apology from Hirshman. Initially, he refused to apologize for refusing to condemn the posters. He repeatedly said he would be happy to meet with the concerned students to discuss the matter, but the protest was not the appropriate way to have the discussion. Alkhawaja said the protesters wouldn’t agree to leave simply after Hirshman promised to meet with him privately. He continued to demand an apology. 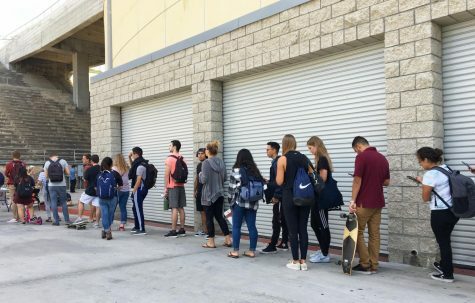 “The only thing that will get these students to leave is a public admission that you’re sorry for the way you’ve treated them,” Alkhawaja said. “We have done things, inadvertently, that have upset or hurt people, and we are sorry for that,” Hirshman eventually said. The university has not officially commented on the demonstration. 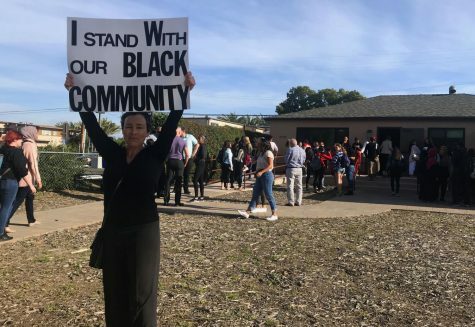 A.S. Board of Directors member Mustafa Alemi said he gathered with a group of activists Tuesday night after seeing the email and planned the silent protest. Alemi said preventing Hirshman from leaving via car wasn’t planned, but demanding an apology was. 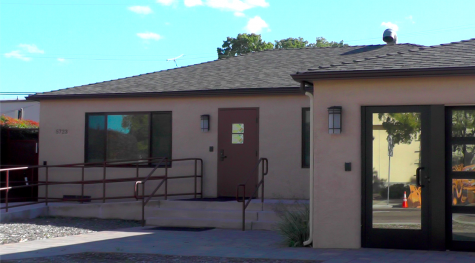 “Well, we’re listening now,” said Randy Timm, Dean of Students. Editor’s Note: We have updated this article to include a photo of the original flyer with the names of students blocked out. Whatever happened to the law that said if you impede someone’s ability to leave (in this case 1-2 hours) that is a form of kidnapping? Why did the police take no action? Obviously because the weak kneed president ordered them not to. You only enbolden them and encourage the next incident of brown shirt tactics by this bunch. Appeasing Islamist thugs/kidnappers only emboldens and encourages them. 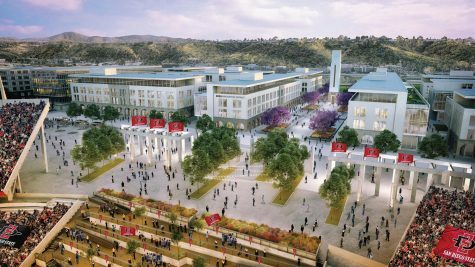 SDSU is becoming a national laughing stock as one of the nation’s Islamist-run indoctrination factories. Even notorious leftist UC Berkeley allowed “Islamophobic” Bill Maher to speak at the 2014 Winter Commencement ceremony after the UC President overruled student fascists who had banned him. Maher’s speech went off uninterrupted, proving that standing up to campus bullies only exposes them for what they are and they usually back down. How about the California law on false imprisonment? While kidnapping probably entails moving a person, the below laws seems more applicable. Permitting their thuggish tactics is nothing more than Muslim PRIVILEGE. Hirshman should be fired for his double standard towards muslim students. This poster was racist and xenophobic and Hirshman should’ve denounced the hate speech in his first email. Nothing like trying to convince people you are not a terrorist by trapping the university president in a police car for an hour. These protestors showed that they run this campus, not the administration. Even the police didn’t shut this down. People should reflect on this before sending their kids to this school. If the college president is powerless against these groups of bullies on campus, what hope does your kid have? And by the way, this college has shown these radicals that they can be bullied. Want to bet it happens again? The sheer thuggery of Osama Alkhawaja and his fellow Muslims in surrounding President Hirshman’s vehicle and preventing him from leaving for TWO HOURS should have led to their arrest. It also confirms accusations that these Jew-haters ARE in fact terrorists. 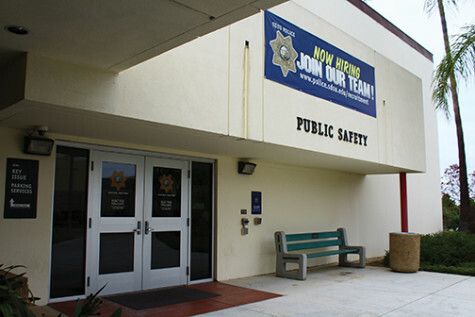 SDSU cops need to be out in full force when student-sponsored speaker Horowitz appears next week on campus to assure these Muslim thugs dont pull any more of their strong-arm Jihadist tactics and arrest those who cause problems. Why did Dr. Hirschman ultimately apologize – because he was sorry, or because he was surrounded by a hundred angry people? Is an apology under physical duress really an apology? This was physical bullying, period. I’m seriously ashamed of my alma mater. 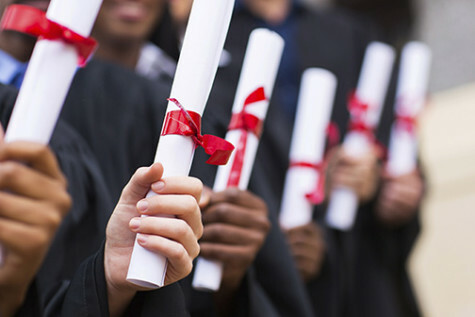 I am proud of you students. I can’t believe that Hirshman did not immediately condemn the printing of student’s names on these flyers! It’s obvious that he has no ability to separate his own personal biases from his responsibility his to protect students. The poster does not accuse anyone of terrorism. It states that they have allied themselves with terror organizations or persons. This pitiful of a level of reading comprehension is either woefully ignorant or despicably dishonest. It is interesting that those terrorizing the president are the ones that are hollering at him that they are not terrorists while they kidnap him (see previous posts). Hmmmm, a an angry mob “trapping” the President’s car and refusing to let him leave (the use of violence and intimidation) until he complies with their demands for an apology (in pursuit of political aims) … and they say that they are not terrorists?? … Don’t they know that a coerced apology is worthless anyway? Guess what? You act like a terrorist, people have a right to call you a terrorist, and it is not the President’s job to protect you. 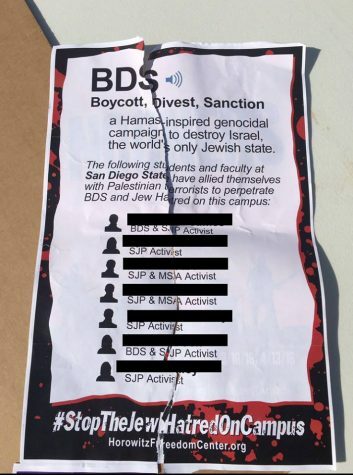 I find it very interesting that those individuals who are named on that Horowitz flier find it offensive that their name is being used on a flier that identifies them as supporters of BDS, even though they do not deny the facts that they support BDS?They just don’t want to be labeled “terrorists”. BDS is targeting Israels legitimacy, the very existence of that State. Consider the circumstances how this has been done from the Palestinian side for decades, including suicide bombs, attacks on public busses, more recently knife attacks on bystanders, and the complete refusal on the political side to accept the State of Israel. All these are trademarks of a terrorist organization. To question those fliers as an “incitement” and that they are not protected under “Free Speech” but calling for the elimination and to delegitimize Israel is not an incitement is about as backwards as someone can have it. I do believe in our constitution and you are welcome to live as our Constitution regulates our social lives but you would have to enter the 21st century of human rights, social equality and freedom and behave this way. So far you only have acted just as terrorists and have not committed to the freedom and liberty of all. And an additional comment might be necessary towards the SJP. The SJP is not the Social Justice Activist Program but Students for Justice in Palestine. This organization believes as well that the State of Israel has no legitimate, legal right to exist and is anti-semitic. Here I just want to point to the 1st Amendment of the US Constitution. This organization with their anti-semitiic stand is not on the grounds with what our Constitution is all about. You might want to rethink your allegiances here or find yourself in a hurry on a certain list of “hate groups” with possible ties to terrorist organizations.